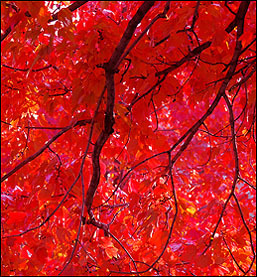 Scarlet Red Maple Tree, think of a brisk autumn walk along a calm country lane, with the brilliant fiery red fall leaf colors of the scarlet red maple. You will find the Scarlet Red Maple is priced much less than the red maple cultivars and gives the best bang for your dollar of any of the fast growing shade trees. Red Scarlet Maples have long been valued as ornamental trees for shade, specimen, autumn accent, or wet sites because of their ease of establishing rapid growth, brightly colored flowers and fruit, and fall leaf colors that will ranging from yellow to orange to the brilliant red foliage that it's known for. Whether you are lining a lane on your property, planting a few specimen trees, or wanting a fast growing shade tree, you are making the right choice with the Scarlet Red Maple. Our Scarlet Red Maple Trees ship as 2 to 3 foot tall bare root plants.